Most people perceive cars and trucks as modes of transport. Nick Ashby, the owner of Rockstar Performance Garage in Murrieta, Calif. views them as an artist canvass. 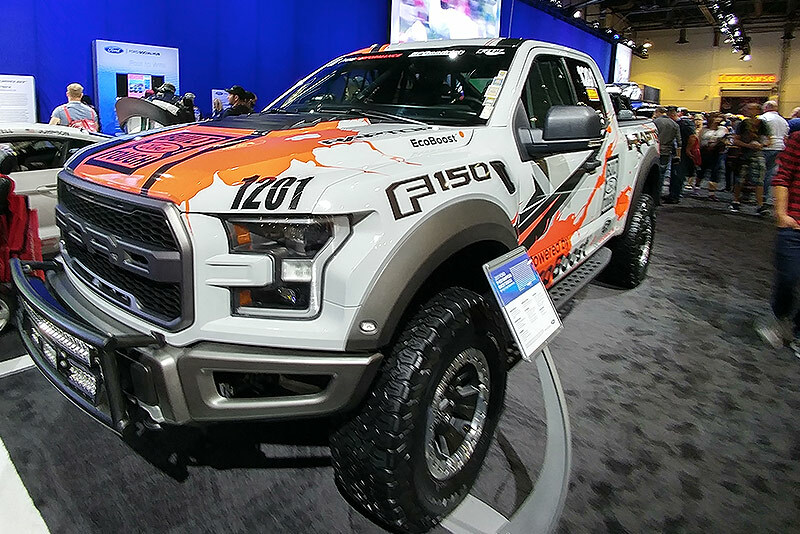 Ashby’s automotive artistic talent was on display in Las Vegas this week at the giant trade show put on by the Specialty Equipment Market Assn., commonly referred to as SEMA. He had 18 customized vehicles at SEMA, a three-day event that draws 160,000 automotive industry insiders seeking different ways to sell myriad auto parts and designs to enthusiasts who want to pimp their rides. The show features the newest products for racing, off-roading, infotainment, electronics and aesthetics. Hyundai displayed Ashby’s work on a Santa Fe crossover featuring large black 35-inch wheels that pop against the gray and white pixelated paint pattern in the lower side panels, blacked out windows and taillights, and highlight Rockstar’s well-known yellow star logo. The Santa Fe was something Ashby said he wanted to build that people could see themselves driving every day. His biggest surprise from the project was avoiding the check engine light trigger after upgrading the engine to handle nitrous gas or mounting the 35-inch tires on the vehicle. Elsewhere, Ashby’s artistry was featured in the Bullet Liner booth, a company known for innovative advances with polyurethane protectant coating. The “Super Truck” Ford F-150 Raptor is sprayed from top to bottom with Bullet Liner’s black and red spray sealant finish. Turning production vehicles into fancy concepts, like what Ashby does, is a tradition that goes back at least 78 years. One of the first true concepts was the Buick Y-Job, built in the 1938 by Harley J. Earl, who directed the styling at General Motors from its inception as the Art and Colour Section in 1927 until his retirement in 1959. GM said the Y-Job was intended to showcase future Buick and corporate styling. It was a two-passenger sports convertible built on a standard Buick chassis. The car boasted hidden and power-operated headlights, electric windows, flush door handles and unique styling. Buick still uses the ‘waterfall’ grille design today. The vehicle was used by Earl as an everyday car until 1951. That type of creativity and ingenuity is what SEMA represents, according to its organizers. More than 2,400 manufacturers of automotive parts exhibited at the show, which has more than 1.2 million square feet of exhibit floor space devoted to customizing vehicles. Some exhibitors have parts ready for purchase, while most have product examples, catalogs and free swag for attendees to grab while mingling with representatives. The aftermarket parts industry is a $39.2 billion business, according to SEMA. It’s typical for automakers to bring customs that also utilize their own internal performance parts; Chevrolet, Ford, Toyota, Honda, Kia, Fiat Chrysler’s Jeep and Mopar brands all joined in the tradition. Automakers leverage concepts to communicate with the consumers and gauge their interests. At the same time, aftermarket parts suppliers use concepts to exhibit their wares, while builders present their design flair and abilities.